Over the past couple of years, and in the past couple of weeks, I have taught four of my five children how to knit. They’ve watched me knitting, and have naturally wanted to join me. I honestly can’t remember now how I taught Keats and Gabriel, as it has been so long. More recently, I taught Larkspur, and finally Seth, but this time I unexpectedly gained a mentor. I found myself in the privileged position of having a dear woman whom I share a mutual friend with, begin sending emails to Larkspur and I about knitting. 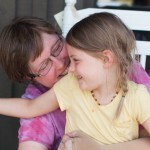 These emails have guided me in teaching Larkspur, and I think that they may help you too. I could cut them up, and turn this into an impersonal guide, but I don’t want to edit her words, and think you can gain more from her letters in their entirety. With Elizabeth Dehority’s permission, I am going to share with you the letters she has written to Larkspur, and some to me as well in the order in which we have received them. I hope that you are as blessed by these letters as Larkspur and I have been. I will give a list of Elizabeth’s recommendations at the end of this post, so that this tutorial of sorts can be revisited and those things she recommends easily found. Your mom put pictures of your beautiful cast on row on her blog, and it was the very first thing I saw this morning. What a wonderful way to start my day! Teaching four and five year olds to knit at the Montessori school by my house is one of my favorite things to do. I can’t even count as high as the number of children who now knit at that school, because even though I can only teach some, they all end up teaching each other. That makes me really, really happy. IN. AROUND. THROUGH. OFF. IN. AROUND. THROUGH. OFF. If you say it out loud, even your little sister will learn it, and then when she walks around chanting ” in around through off in around through off” it might drive you crazy, but that’s OK. Someday she’ll be a knitter, too. The second thing is this. 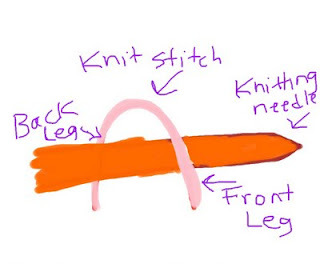 Every knit stitch has a front leg and a back leg. I put a very sloppy drawing down at the bottom… Pretend your knitting needle is a horse and think about your stitch like a little guy sitting on his horse. He has one leg on your side of the horse and one side on the other. Can you see it in your imagination? We call the little guy’s right leg his front leg because it’s in FRONT of the knitting needle… But you probably already figured that out. It helps to think about “in around through off” and front legs and back legs because then when you start to do fancy things like increasing and decreasing, we can talk about it using those words and make it SOOOOO easy. And now I have to take care of a naughty three year old. I’m not even going to tell you what mischief he’s been into already this morning. Keep up the good work! I am so happy to start my day knowing there’s a new knitter in the world!!!! 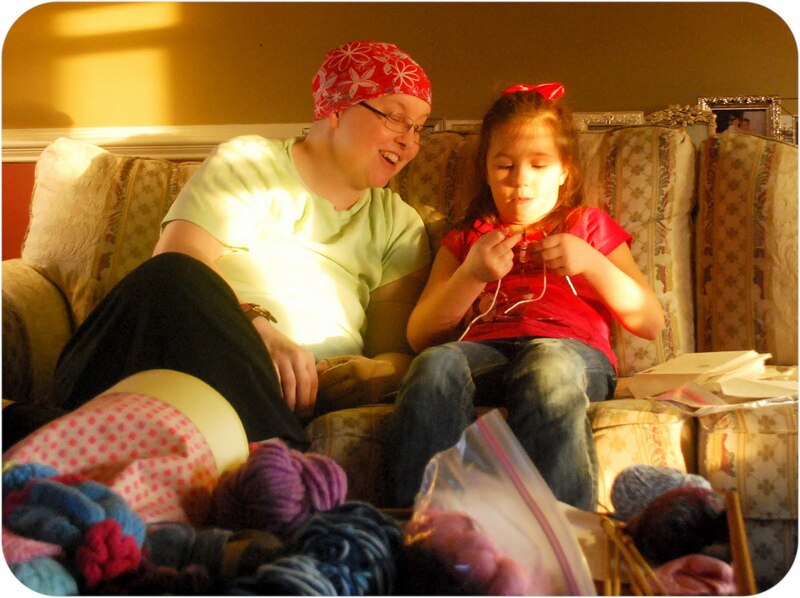 I always offer up each chemotherapy for some particular intention, and tonight was your knitting relationship with Lark…. I am a praying knitter… I do not sit still well AT ALL and knitting while I pray has been essential for my spiritual life for a LONG time. 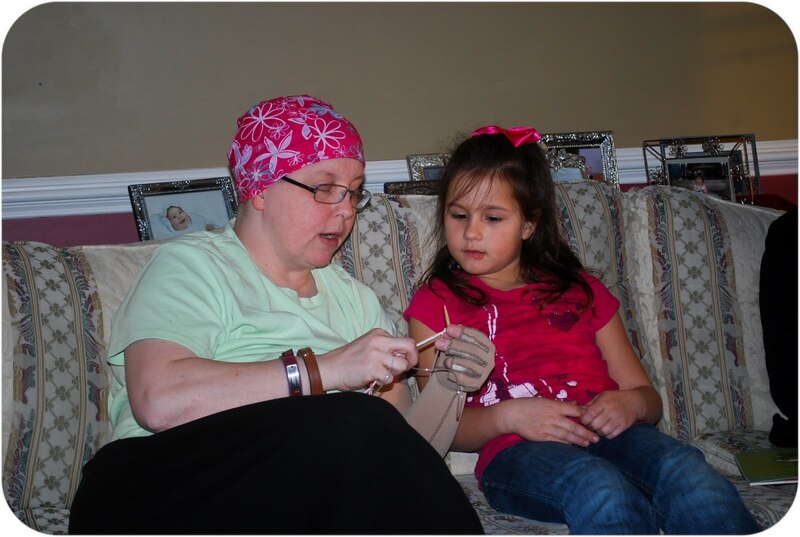 But usually during and after chemo lately I just don’t feel well enough to knit, so I sort of need to connect it all back somehow… So offering up everything that goes along with chemo… Especially the not being able to knit part… Helps a bit. 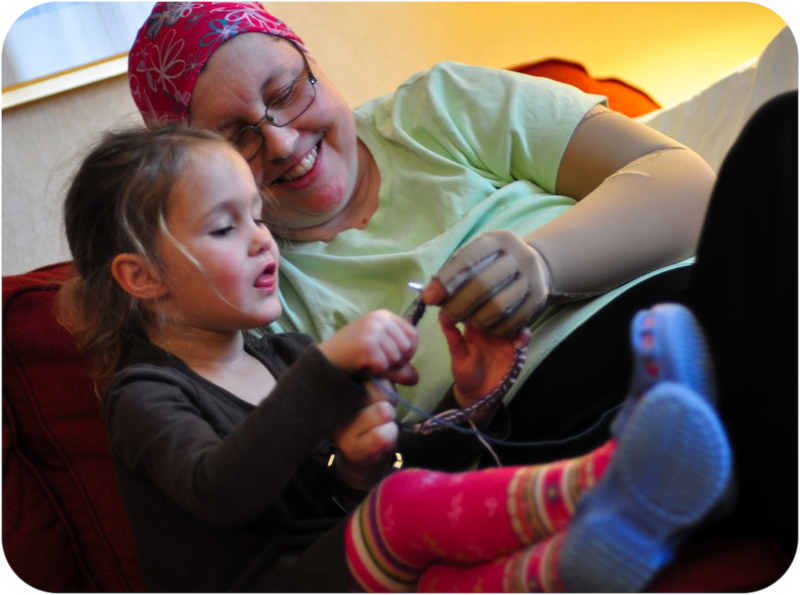 Tonight is a chemo night, and tomorrow I will be pretty much worthless, but I PROMISE you some notes on teaching little ones. First of all, what you are doing is perfect, perfect, perfect. Just BE WITH HER. 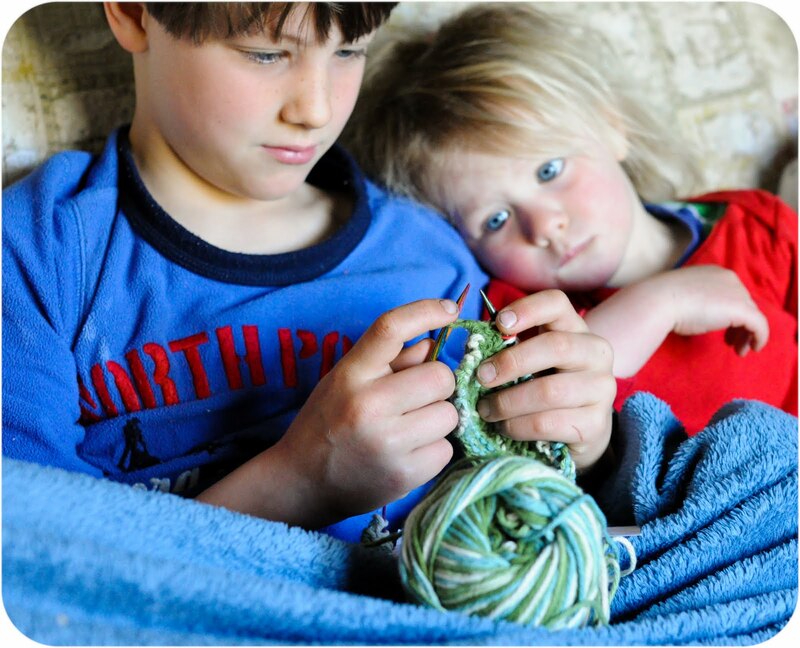 For three and young fours, or often boys up to 5, 99 % of the knitting we do is actually the adult’s yarn and needle manipulation. 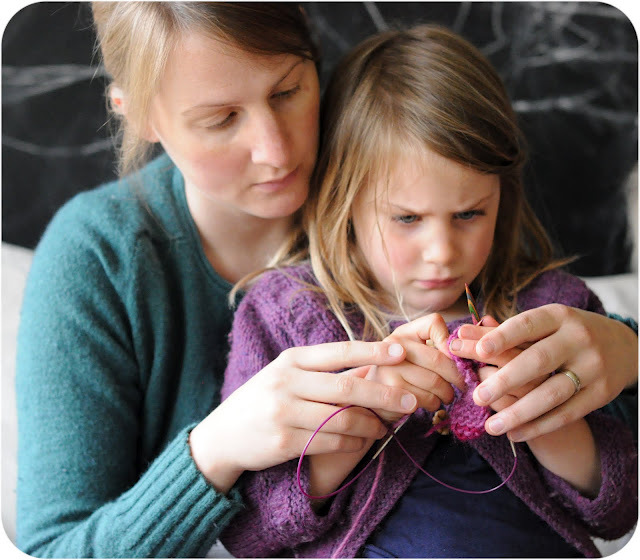 Sit the child facing the same way you are (you probably don’t have much lap left 🙂 (I am eight months pregnant) and start with your hands on the needles, you tensioning the yarn, and the child’s hands resting gently ON YOURS. Hand over hand. As they chant In around through off, etc, they will naturally start reaching for the yarn to bring it around, and helping you click it through. Say nothing about it, just notice as they take over the tiniest movements, when they start to press your hand into the right direction ever so slightly. Then pick one part… “You do in” and I do around through, off… and then pick a different part. You will find that gradually, hand over hand has become your hands over theirs! Or sometimes one on one side, the other on the other. OFTEN,to take a rest, do a whole row yourself and tidy things up. But you need to have something to say while this is going on, otherwise it’s “Hey! What are you doing to my knitting!) But things that demand such high level of concentration from such little ones musn’t last too long without little breaks. More knitting with small ones thoughts might not be till Tuesday, the day after chemo I usually sleep most of it through. Seeing the pictures of your first knitting last week reminded me of so many brand new knitters I’ve known. I wish I could show you a you tube video of the first time I tried to show somebody how to knit… But back then not only wasn’t there YouTube, there weren’t even computers. I was four years old, and my mom had just taught me to knit, purl, and pick up dropped stitches. I was so excited about learning that I decided to teach my sister. The problem was that she was only two years old, and you know how two year olds are! My mom and dad have a film movie of it, though… maybe my dad can get it put on a DVD so I can upload it and show you. Most of the kids I have taught how to knit have been in the primary classrooms at the Montessori school by my house. 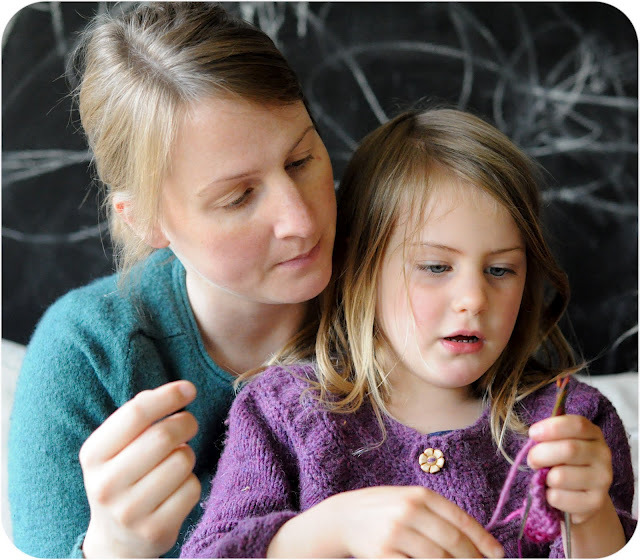 It’s a little different teaching kids in a school than knitting with your own kids at home. Did you know that some children have never actually seen anybody knit, and don’t even know that wool comes from sheep? When I teach school kids how to knit, I have them make their own knitting needles. We make our own needles for two reasons. First of all, it would be way too expensive to buy fancy knitpicks harmony circular needles for everybody, even though I think they are the very best to learn with. The second thing is this: for lots of people, especially boys, knitting helps make it easier to sit still and be a good listener. Well, I need the kids to be able to sit and listen while I explain about wool and sheep and how they get the wool off the sheep, and how we can spin it into yarn. But the kids who need to listen don’t know how to knit yet! So while I’m talking I have them make their own knitting needles. Before the class, I cut 3/16 inch dowels into 10 inch lengths and sharpen one end in a pencil sharpener. While we talk about yarn, the kids use really fine sandpaper to make their needles SOOOOO smooth that they can’t feel any rough spots anywhere. 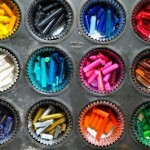 They sand and sand and sand… Then they use polymer clay to make a knob for the non-pointy ends. Finally, we rub beeswax into the wood… And rub and rub and rub…. Usually by this time we’ve talked enough for one day! Then I take the polymer clay knobs home and bake them in my oven and glue them on the ends of the polished needles. Then the next day I bring the brand new knitting needles back and we can really learn to knit. I’ll tell you all about that in a minute, but first I have to put George back to sleep. We left off with the school students and their brand new knitting needles. Now we get to really learn how to knit. I think it’s best to learn how to knit with wool. Wool is stretchy and squishy and real. Usually I teach knitting with Paton’s Classic Merino, because it’s just regular worsted weight wool yarn that’s not expensive. But you know how when yarn comes in a big round hank, and you get to hold it out with two hands while someone else winds it into a ball? That’s one of my favorite parts of knitting. 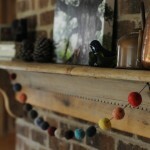 I LOVE winding good wool yarn into a ball to knit with. The problem is that the Paton’s Classic comes already in a ball, so the kids don’t get to do that part. Sometimes I think I should take the yarn and put it INTO hanks, just so kids can try getting it FROM the hank into balls, since most of the kids have never gotten to do that at home. So anyway, now we have needles and wool yarn. What do you think we have to do next? If you guessed “cast on” you’re right! Somehow we have to get the yarn onto the needles so we can learn our knit stitch. Even when I’ve got a whole classroom of kids to teach, I always let them learn how to actually knit one at a time. You and I already talked about learning how to knit. 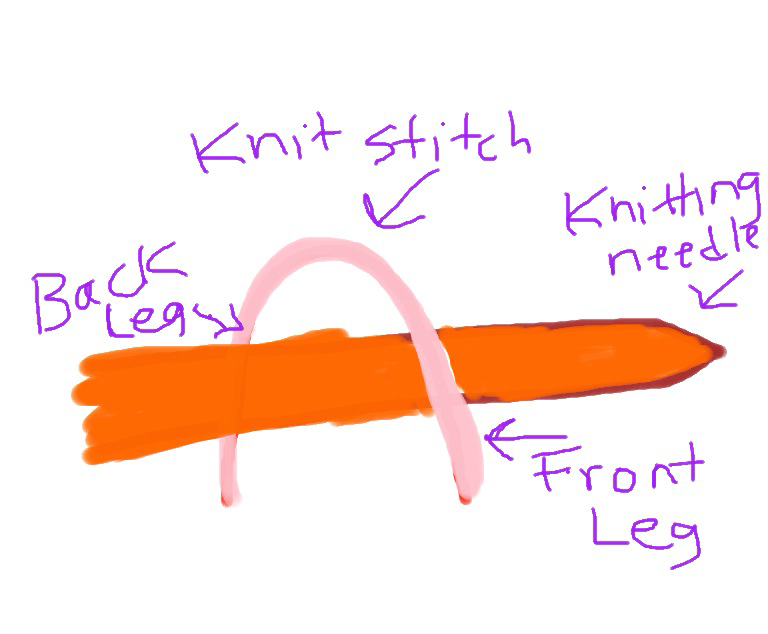 The two most important things to get stuck in your head are “in, around, through, off” and what a knit stitch actually looks like, with the two legs, the front leg on the right and the back leg on the left. Usually the first project I have kids make is just a regular square. You can do so many things with a knit square! I think you could think of ten different ways to use a knit square in less than a minute. But here’s the tricky part: You can make a square by starting on one of the sides and knitting across to the opposite side, OR, you can knit a square by starting in a corner and knitting to the opposite corner. 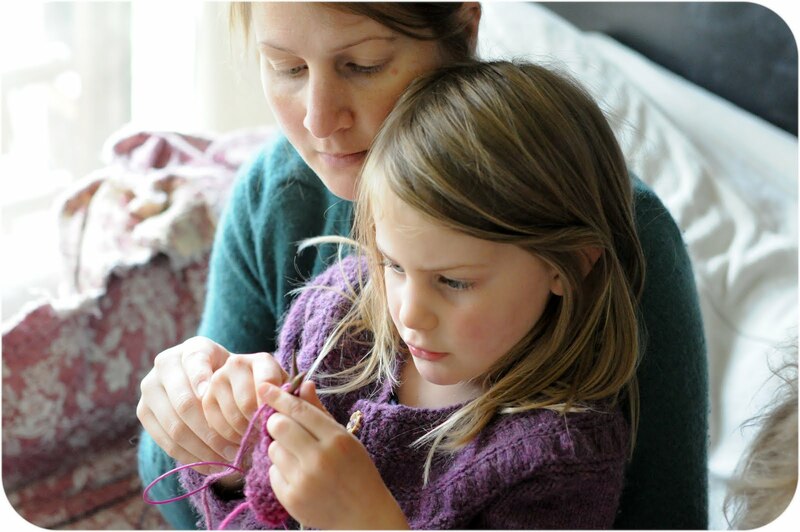 If the person learning how to knit is four years old, or maybe five, I usually cast on twenty stitches for them and teach them how to knit across. You should be able to find this at your local craft store. 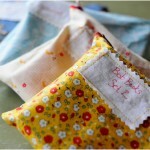 Elizabeth recommends a simple square as a first project. If you have the child knit two of them, you can add a bag of beans to the middle, sew them together and make a bean bag! 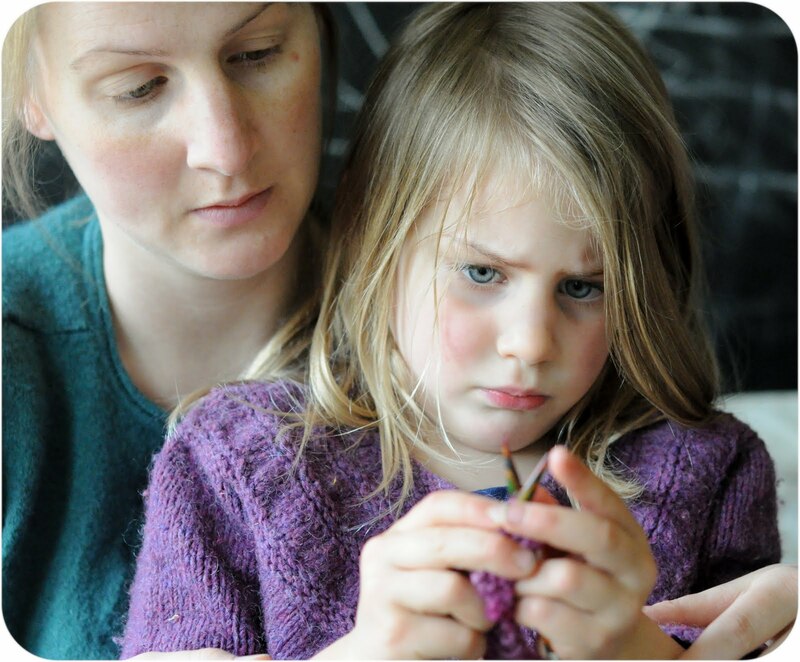 If you are knitting with wool, such as the Paton’s you can even help the child to wet felt the squares first, adding another element of fun to that first project. Larkspur’s first project is a doll scarf. At five years old, her attention span is quite short, and for a doll scarf she just cast on 5 stitches. To sit down and knit a row only takes a matter of moments. Sometimes that is all she is interested in doing. I hope that Elizabeth’s words will help you teach the little ones in your life to knit, as they have helped me. If you are so inclined, would you mind saying a prayer for her? I am am school teacher and In 2 terms have managed to teach 23 children to knit. The greatest thing is they all love it. I just learned to knit and that’s what my teacher kept saying to — in around through off, and the two legs! I’ve just found your blog and it’s wonderful! This post in particular is so inspiring. I wish I had read this when my daughter was little! We had several short-lived attempts but she wasn’t really interested. Finally, at 16, she got into it and can now knit! Hoorah! Mind you, we are all late knitters in our family – I was the same, casting on 10 stitches and knitting “scarves” that wavered in and out along the edges. I was always a VERY basic knitter but then my brother, while waiting for admission to nursing college, looked after a man with muscular atrophy, and he shared his care with another chap, 12 hours on, 12 off. When Simon was on nights, he found it very hard not to fall asleep (this was before 24-hour television) and asked me to teach him to knit. I taught him what I knew- basically knit, purl, cast on and off- and left him to it. Pretty soon he was producing sweaters of INCREDIBLE complexity which I could never dream of achieving. So he taught ME to knit…! That was when I was 21, and by the time my first godson was born when I was 27, there was pretty much nothing I couldn’t knit. Baby clothes are so great because they’re quick! I’m off work, also with breast cancer, at present, so I shall bear in mind what Elizabeth says about knitting/praying though chemo. I am knitting for England at present, but she is right: some days, opening your eyes is an achievement. However, my present secretary and my former secretary have just become grandmothers/great-grandmothers respectively, so hopefully I shall get something done for the newbies before they grow out of them! I actually came across your blog from your lacy newborn hat pattern on ravelry and stuck around to browse awhile, enjoying the tone of your post. I have a smart and precocious three year old that would just faint from excitement if I suggested teaching her to knit, and this has given me the confidence to at least start the basic motions of hand-over-hand knitting and the hopeful joy of a completed project (the beanbag idea is perfect, oh how her eyes will shine!) together over time. Thank you for sharing the beautiful letters from Elizabeth for others to read and enjoy. NÃ£o foi por uma questÃ£o de reeoniacamlnto do meu amigo com o Dr. MAmaral, foi apenas por me ter desafiado a escrever alguns apontamentos sobre polÃ­ticos, o que acho uma ideia interessante e como foi o senhor a sugerir, lembrei-me de lhe oferecer, mas pode ter a certeza de que mais virÃ£o, e o senhor nÃ£o vai ficar Ã margem. Um abraÃ§o amigo. I promised ESD tonight that I’d look up the letters to Larkspur since she explained to me the story of the little rainbow doll hat in the Top Secret Book! So wonderful! My three-in-January-year-old daughter asked for help in knitting a baby blanket today after she was caught getting into my knitting. I pulled out my shortest cabled needles, let her pick some scrap yarn, and told her we could start her “podrect” after nap. Oh, how she wept when I told her we needed to nap first. The instructions and encouragement from Elizabeth are just what I needed to help me help my own Elizabeth with her project. I am not sure how long her interet will last, but I look forward to the moments we might have knitting together. I just barely know how to knit. I only know 1 stitch because I watched a lady in the waiting room while our cars were in for repairs. She noticed me and asked if I wanted her to show me how to start it. I of course said yes and to this day, about 13 years later, I know only 1 stitch. 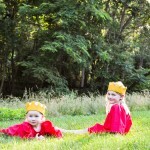 I have recently lost my job just coming off maternity leave (child #3). It’s just sinking in that I have no deadlines and I know God has a purpose for it. After reading through the letters it not only makes me want to knit and crochet more but use that time to pray. For my family, friends, and our country. I don’t know if i missed it or ifit was not shared the type of cancer she has but i know from working in oncology in the past just how much it can take out of someone. So I will definitely keep this gem I’m my prayers for complete recovery so she can continue to teach this wonderful art to others. What a lovely article, thank you so much for sharing. Sending prayers to Elizabeth! I will be once again teaching a group of 1st through 4th grade students to knit this school year and was looking for some inspiration. I’m 11 and an avid knitter – i really wanted to teach my sister and this has helped. I am teaching a group of children to knit and was looking for some child friendly patterns when I came across this article. I have tears in my eyes! I will definitely keep Elizabeth in my prayers. I got so much more than I bargained for here. Thank you so much for posting and God bless!!! You are so welcome! Thank you for praying for Elizabeth! thank you so much for this post. 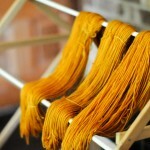 I’ll be teaching a children’s knitting class for our homeschool co-op this fall. it will also be my first teaching experience when it comes to knitting so this really helped prepare me. Thank you.